I've gotten some more feedback on one of my Journal Club posts, from Sean Carroll and Chris Hittinger, the authors of the Nature paper on gene duplication that was the focus of one of my recent reviews of an article from the recent scientific literature. Chris identified some minor imperfections, and I've revised the original post in response to his comments. This got me thinking. Most of my Journal Club posts are constructed according the BPR3 guidelines, and are indicated as such by the "Blogging on Peer-Reviewed Research" icon. The icon, and my participation in the BPR3 organization, are meant to direct readers to blogging that adheres to the kinds of academic and scientific standards that characterize real scholarship. But some of my posts have actually been reviewed, by the authors of the scientific articles about which I've written. That is, some of my articles have been peer reviewed, and this means that I'm particularly confident in the completeness and accuracy of that work. So I designed a new icon, to indicate a post of mine that has been peer reviewed, by at least one of the coauthors of the research under discussion. Three of my posts now display the new icon. I've also instituted a new topic label, "Peer-reviewed blog post," which will only be attached to articles that have undergone this type of review. the post was revised to address any corrections or clarifications offered by the reviewer(s). And don't thank me -- thank the busy and hard-working scientists who take the time to read the blog entries and provide thoughtful feedback as well as encouragement. These folks are typically quite pleased to know that Christians want to read and understand their work. So, thanks to them, and thanks to you for reading. "Junk DNA" is a very popular subject among anti-evolution commentators. At the Discovery Institute (DI) and Reasons To Believe (RTB), as well as other creationist outlets, you can find ample discussion of "junk DNA" and why it matters to Christians who don't like evolution. I've mentioned this topic several times myself, because I believe that the misuse of science by creationists is seldom more in evidence than when opponents of evolution confront genetics and genomics. As I've noted before, common descent provides a superior explanation for the extraordinary facts gleaned through comparative genomics (i.e., the examination and comparison of genome structure, overall and in detail, among different types of organisms), and there is no competing scientific explanation. As I see it, a knowledgeable Christian person considering these data has exactly two rational alternatives: 1) acknowledge the explanatory power of common ancestry and accept its reality; or 2) acknowledge the appearance of common ancestry but deny its reality. Any other choice is indicative of ignorance or of some form of intellectual dishonesty; I have advocated the use of the concept of folk science to account for the tendency of some apologists (e.g., the "scholars" at Reasons To Believe) to misrepresent science in defense of their preconceived interpretive framework. Regarding so-called "junk DNA," the claims of the DI and RTB are quite similar, and I will consider them together here. My assertion in these next 3 posts on "junk DNA" is this in a nutshell: the writing of the DI and RTB on the subject of "junk DNA" is a melange of half-truths, non sequiturs, quote-mined proof texts and outright fabrications that adds up to one of the clearest examples of folk science that I can imagine. My conclusion is that one would be very unwise to consult these sources for knowledge about developmental or evolutionary genetics, and that the architects of this deception are engaged in scholarly misconduct if not outright dishonesty. When these apologists write about "junk DNA," they commit sins of commission and omission. I've identified 3 significant themes in this edifice of folk science, and the 3 posts will deal with each in turn. Creationists insist that "junk DNA" is functional and therefore that evolutionary claims regarding its origin are mistaken. Creationists systematically ignore fact and theory regarding the nature of vast numbers of non-coding genetic elements, which make up the bulk of the genetic material that is referred to as "junk DNA." Specifically, these apologists ignore (and sometimes deny) the fact that millions of chunks of DNA in the human genome alone are known to be mobile genetic elements. Creationists distort the nature of ongoing research and debate concerning the evolutionary roles and fates of various "junk DNA" elements. I'll deal with these 3 themes in 3 upcoming posts, but here are some teasers. Creationists of various stripes commonly claim that because evolutionary biologists automatically assumed that non-coding DNA lacked function, little or no research on the subject occurred for decades. That claim is doubly false: biologists have always adopted various stances on the functional roles of non-coding DNA, and consequently research into its function has proceeded apace. Enormous numbers of DNA elements that make up the bulk of the human genome -- and most of its non-coding "junk" segments -- have been identified and are being actively investigated by molecular biologists. These elements are anything but mysterious: they are so-called mobile genetic elements of various kinds, with well-known properties. Their properties, and their use in scores of analyses of evolutionary relationships, are systematically omitted from creationist writings on the subject. The proteins that enable animals to smell are called olfactory receptors (ORs). The human genome contains about 800 OR genes, but more than half of them have been inactivated by mutation, yielding what are called pseudogenes. These "fossil genes" are found in precisely the same locations within the genome as are the fully-functional versions in other mammals (i.e., mice). Analysis of these genes and their properties has led to the construction of a highly coherent explanatory framework that accounts for the existence of these pseudogenes and the evolution of smell in vertebrates. Looking for a creationist approach to these data? The word 'olfactory' appears nowhere on RTB's website; at the DI, you'll find it in lots of articles...about stem cells. So, stay tuned, or if you just can't wait go to Genomicron, a superb blog about nothing but genomes and evolution. Recently I made a few comments on Greg Laden's Blog over at ScienceBlogs, in which I expressed some, um, concern regarding an aroma of ugly anti-Christian thuggery. The context was a silly (and banal) article on the "War on Christmas," which is some idiotic dustup in the so-called Culture Wars. I've bashed Richard Dawkins' The God Delusion repeatedly on this blog. I'll probably do it again. And I dissed another crappy blog at ScienceBlogs because it consists of far more "atheist chest-beating" than science or scientific commentary. All this might give the impression that I don't like atheists, or that I object when they get loud and feisty, or that a prominent aim of this blog is the debunking of atheist claims or the engagement of atheist polemics. Let me be clear: none of the above is true. My primary audience -- the group of people for whom I intend to write -- is Christian, and especially evangelical. This doesn't mean that I assume that only Christians will read or appreciate the blog, but it does mean that I nearly always write with thinking Christians in mind. I am working to discredit the anti-evolution folk science of Reasons To Believe because I want evangelicals to abandon apologetics that damage the reputation of Christ and the church, and so I'm writing about their elementary errors for the sake of Christian integrity. Debunking nonsense and disarming attacks of various kinds are major goals of mine, but the targets aren't atheists -- they're Christians. But still, you might wonder what I think of the New Atheists. In short: I think they're a welcome addition to the public square. Here are a few of my reasons. For one thing, such opposition is a bit like peer review. The New Atheists aren't merely announcing their unbelief. They're saying, "we think your belief is idiotic." And they're saying, "we think your belief is harmful." I say we think of those challenges as negative comments from a manuscript reviewer. In science, when you get a nasty review of a manuscript, you either revise the manuscript or you explain to the editor why the reviewer is mistaken. (Or both. Usually both.) Even if the reviewer is a butthead, her/his critique must be effectively dealt with if the editor is to be convinced that the paper is worthy of publication. As I've mentioned before, peer review often makes the original article much better. I suspect that many atheists don't care to be identified with an "atheist community" at all, but to whatever extent they do, they can use the New Atheists as a starting point for identifying areas of specific interest in public discourse. The New Atheists are speaking loudly in the public square, and some of them have staked out positions that may not represent anything remotely resembling a generalized "atheist" position. I am eager to know, for example, whether most atheists would find Francis Collins' description of his conversion to represent a religious attack on science. Sam Harris apparently does. Is this a typical position for an atheist? For an atheist scientist? I would prefer to work with unbelievers who reject such warmongering, just as I would prefer to work with Christians who denounce and disavow just about everything Pat Robertson has ever said. The New Atheists, if nothing else, have created new topics for discussion, and given everyone new opportunities to weigh in on those questions. Now don't get me wrong. I don't think the New Atheists are stupid for doubting, or even for considering Christianity to be rubbish. I just don't find anything in their writing that is a threat to my belief. So...here's to the New Atheists. May God richly bless them. Last week I discussed the notion of folk science as an approach to understanding creationism. The basic idea is this: folk science is science-talk which can be of any degree of accuracy and that has the sole purpose of supporting an already established world-view. As such, folk science does not seek to inform; it seeks to encourage, and any accurate information transfer is incidental. Folk science is employed by people of various persuasions; I used The God Delusion and an especially misleading blog post from Reasons To Believe as two examples. I asked for feedback, and I got some very interesting and provocative responses. By way of rejoinder, let me state some principles that should stand alongside any use of the folk-science construct in the analysis of creationist or ID claims. Some of these were contained in the original post (or seemed obvious to me), others I've gleaned from the commenters (with gratitude). 1. Identifying a piece of commentary as folk science does not rule out duplicity on the part of the author or speaker. Some folk science is almost certainly deliberately dishonest. For example, earlier this year David Menton of Answers in Genesis wrote a blurb about the famous transitional fossil Tiktaalik, in which he made claims that seem to be clear fabrications. His work is pure folk science, but it appears also to be disgracefully dishonest. Here, the folk science context provides explanation for his behavior, but of course does nothing to excuse it. 2. Identifying a folk scientific claim as false -- no matter how ludicrously so -- does not necessarily imply dishonesty on the part of the author or speaker. Hugh Ross of Reasons To Believe claims that speciation has recently ceased on earth. This claim is utterly preposterous, but Ross probably believes it to be true. He's not (necessarily) being dishonest. We can and should identify this as foolish and careless behavior (considering that the writer has a Ph.D. in science), we might conclude that the writer lacks credibility, we might use the term 'misconduct'. (I would. I will.) But dishonesty? Probably not. And of course, people routinely promulgate falsehoods without knowing their statements are wrong. Sometimes this error is wholly excusable, sometimes it's indicative of irresponsible credulity or some other form of intellectual sloth. The guy who cooked it all up may very well be a liar, but his dupes ought to get the benefit of the doubt, at least at first. 3. The capacity for self-deception in humans is not to be underestimated. See Siamang's fantastic comment in the previous post. 4. BUT...while some people get a pass, at least in their first at-bat, others must be held to a higher standard. A scientist who identifies himself as a "scholar" at a "think tank" that hosts regular radio shows, and who travels the globe giving lectures on creationism and faith, and who publishes a book every year or so, and who holds a Ph.D. in, say, physics or astronomy or chemistry, must be expected to adhere to minimal standards of scholarly rigor. Manufacturing folk science, in my opinion, is already outside these minimal bounds, and when that folk science is grossly inaccurate then the "scholar" is not just disreputable -- he's engaging in serious professional misconduct. (Some would argue that I'm overly generous in my continued inclusion of such an individual in the scholarly community.) This, I think, is the principle that both Henry Neufeld and Steve Martin are employing in their excellent comments. For more reaction to the folk science concept, go to Threads from Henry's Web, Beyond The Firmament and An Evangelical Dialogue on Evolution. It's good to see that I'm not the only one who's frustrated and not a little ashamed. First topic on which you can't believe Reasons To Believe: "junk DNA." Gene duplication: "Not making worse what nature made so clear"
One of the most common refrains of anti-evolutionists is the claim that evolutionary mechanisms can only degrade what has already come to be. All together now: "No new information!" It's a sad little mantra, an almost religious pronouncement that is made even more annoying by its religious underpinnings, hidden or overt. But it's a good question: how do new genes come about? One major source of new genes is gene duplication, which is as conceptually simple as it sounds. It might seem a little odd, and it's not that easy to picture, but the duplication of discrete sections of genetic material is commonplace in genomes. In fact, a significant amount of the genetic variation among individual humans is due to copy number variation, which is variation in the number of copies of particular genes or chunks of genetic material from individual to individual. Genes can be duplicated within a genome via various mechanisms, one of which includes the rare but fascinating occurrence of whole-genome duplication. In any case, it is very clear that gene duplication and subsequent evolution explains the existence of thousands of the most interesting genes in animal genomes. It should be obvious that gene duplication gives you more genes, but perhaps it's not so clear how this can yield something truly new. For many years, new genes were thought to arise after duplication by a process called neofunctionalization. The basic idea is this: consider a gene A, with a set of functions we'll call F1 and F2. Now suppose the gene is duplicated, so that we now have genes A and B, both capable of carrying out F1 and F2. In neofunctionalization, gene B is free to vary and (potentially) acquire new functions, because gene A is still making sure that F1 and F2 are covered. So the duplication has created an opportunity for a little "experimentation." Most of the time, gene B will be mutated into another piece of genomic debris, a pseudogene with no evident function. (The human genome is riddled with pseudogenes, and that's a story all its own.) Occasionally, though, the tinkering will yield a gene with a new evolutionary trajectory. This model makes good sense and surely accounts for numerous genetic innovations during evolution. But another model has come to the fore in the last several years, in which the two duplicates seem to "divide and conquer." The process is called subfunctionalization, and the idea is straightforward: gene A covers F1, while gene B covers F2. Straightforward perhaps, but this scenario creates some interesting evolutionary opportunities that aren't immediately obvious. Here in this newest Journal Club, I'll look at another example of the experimental analysis of evolutionary principles and hypotheses, summarizing some recent work that examines subfunctionalization in the laboratory. In the 11 October issue of Nature, Chris Todd Hittinger and Sean B. Carroll examine an actual example of subfunctionalization in an elegant set of experiments that seeks to re-create the evolutionary changes that occurred after a gene duplication. Specifically, they looked at the events that led to the formation of a new pair of functionally-intertwined genes in yeast. The genes are GAL1 and GAL3, and there are several aspects of this story that make it an ideal system in which to experimentally explore the creation of new genes. GAL1 and GAL3 arose following a whole-genome duplication in an ancestral yeast species about 100 million years ago. The ancestral form of the gene (see Note 1 at the end of this article) is still present in other species of yeast (namely, those that branched off before the duplication event). This means that the authors were able to compare the new genes (meaning GAL1 and GAL3) and their functions to the single ancestral gene and its functions. The genomes of these yeast species have been completely decoded, so that the authors had ready access to the sequences of the genes of interest and any DNA sequences in the neighborhood. The biochemical functions of GAL1 and GAL3 were already well known. Why did the authors choose the GAL1-GAL3 system for close scrutiny? The two genes are critical components of a system in yeast that controls the utilization of galactose (a certain sugar) as an energy source. The GAL1 protein is an enzyme that begins the breakdown of galactose; the GAL3 protein controls the induction of the GAL1 protein. When galactose is present, the GAL3 gene is induced, such that GAL3 protein amounts increase by a few fold. The GAL3 protein is in turn a potent inducer of the GAL1 gene: when galactose is present, GAL1 protein levels increase 1000-fold or so. The two proteins are very similar to each other, and both are very similar to the single protein that is found in the genomes of yeasts that never underwent the genome duplication. So this means that the ancestral protein is bifunctional: it must carry out the very different processes of induction and of galactose metabolism. Not surprisingly, situations like this are thought to involve trade-offs which resolve "adaptive conflicts" between the two different functions of the protein. The reasoning is straightforward: mutations that would improve function A might degrade function B, and vice versa. So the protein is not optimized for either function. There is an adaptive conflict between the two functions. The GAL1-GAL3 system clearly involves subfunctionalization following duplication, and because the ancestral gene is available for comparison, the story invites exploration of the notion of adaptive conflict. Hittinger and Carroll found that there is indeed an adaptive conflict that was resolved by the evolution of GAL1 and GAL3 following the duplication. But the nature of that conflict is not what some might have predicted. Look again at my description of adaptive conflict above. I focused exclusively on the proteins themselves, claiming that the conflict would arise during attempts to optimize two functions in a single protein. But there's another possibility (that need not exclude the first): perhaps the conflict occurs in the regulation of the expression of those proteins. In the case of GAL1 and GAL3, the two different genes can be turned on and off by two different signaling systems. But in the ancestral situation, there's only one gene and therefore fewer opportunities for diversity in the signaling that leads to expression. The data presented by Hittinger and Carroll suggest that there is not strong adaptive conflict between the two functions of the ancestral protein. If such a conflict existed, we would expect that changes in GAL1 that make it look more like GAL3 (and vice versa) would cause significant decreases in fitness. But that's not what the fitness analysis showed, and the authors inferred that the adaptive conflict must occur in the arena of regulation, and not in the context of actual protein function. The story is complicated, and I'm not convinced that the authors have ruled out adaptive conflict at the level of the structure of the proteins. Nevertheless, their subsequent experiments demonstrate a clear adaptive conflict in the regulation of expression of the different proteins, and an efficient resolution of that conflict in the subfunctionalization of the two genes following duplication. Those results are strengthened by some detailed structural analysis that seems to account for the physical basis of the optimization that occurred during evolution of the GAL1 and GAL3 genes, optimization that occurred in DNA sequences that control the levels of expression of protein. If you're a little dizzy at this point, relax and let's zoom out to reflect on this article's significance in evolutionary biology, and its relevance for those who are influenced by the claims of anti-evolution commentators. First, take note that this article is another example of a sophisticated, hypothesis-driven experimental analysis of a central evolutionary concept. Research like this is reported almost daily, though you'd never learn this by reading the work of Reasons To Believe or the fellows of the Discovery Institute. The mis-characterization of evolutionary biology by the creationists of those organizations is a scandal, and as you might already know, my blog's main purpose is to give evangelical Christians an opportunity to explore the science that is being so carefully avoided by those critics. You don't need to understand sign epistasis or the structure of transcription factors to get this take-home message: evolutionary biologists are hard at work solving the problems that some prominent Christian apologists can't or won't even acknowledge. How does gene duplication lead to the formation of genes with new functions? The folks at the Discovery Institute can't even admit that it happens. Over at Reasons To Believe, they don't mention gene duplication all, despite their fascination with "junk DNA." That's from a ministry that claims to have developed a "testable model" to explain scores of questions regarding origins. This makes me mad. No matter what you think of the age of the earth or the need for creation miracles, you should be upset by Christians who mangle science to serve apologetic ends. I'm a developmental biologist, and therefore partial to many of the arguments of evo-devo thinkers. I'm excited about the union of evolutionary and developmental biology, and I do think that many of the new evo-devo ideas are thought-provoking and potentially fruitful. But the debate is riveting and informative, and I find Lynch and Coyne and their talented colleagues to be alarmingly convincing. I'm worried about some of those cool ideas, but I do take some comfort in this thought: any idea that can survive the onslaught of Lynch and Coyne is a hell of a good idea. It's easy to see how the disputes spawned by the brash (and perhaps rash) evo-devo folks can lead to innovation and discovery, even if many of their proposals are diminished or destroyed in the process. The disagreement is pretty clear-cut, and both sides seem to agree on how to figure out who's right. They'll go to the lab; they'll perform hypothesis-driven experiments; they'll analyze their data; they'll write up their findings; their work will be subjected to peer review. In other words, they'll do real science. Note 1: The ancestral gene itself, of course, isn't available for analysis. The authors are studying the ancestral form of the gene, using a yeast species that never experienced the whole-genome duplication. Note 2: As Hittinger and Carroll indicate in the acknowledgments, the experimental design was developed by Barry L. Williams, who was a postdoctoral fellow in Carroll's lab and is now on the faculty at Michigan State. And by the way, this little state of Michigan doesn't have much of an economy, but boy are we crawling with gifted evolutionary biologists. Hittinger, C.T. and Carroll, S.B. (2007) Gene duplication and the adaptive evolution of a classic genetic switch. Nature 449:677-681. When I was in grad school, some of us figured out a basic rule of thumb regarding the titles of scientific research papers: if the title is in the form of a question, the answer is almost always "no." Here, I'll review a journal article with a question for a title, and its answer appears to be the same as the answer to the question that forms the title of this blog entry. The paper is titled "Do Centrioles Generate a Polar Ejection Force?" Now, there are good reasons to ignore this little article. First, the journal, Rivista di Biologia, is utterly insignificant, and is prone to publishing articles that are clearly on the edge of scientific respectability. Its editor is (reportedly) a creationist and is affiliated with the Discovery Institute. Second, the paper is not a primary research report. It outlines a hypothesis, accompanied by a literature review, but describes no new experiments and reports no new findings. Indeed, when the article's appearance was first announced in 2005, many ID critics made note of both of those facts. But neither is relevant to a scientific review of the work. Rivista is, in fact, a joke, and it is indeed notable that Wells sent his paper there. But that's not a reason to conclude anything important regarding the article's contents. After all, every journal is edited by a group of humans who are biased in various ways and fallible in every way. And every scientific author considers those facts when deciding where to submit a manuscript. Rivista was a friendly venue for Wells. Science seems to be a friendly venue for Michael Shermer. So? And what of the fact that the article contains no data? Well, there are whole journals devoted solely to the proposing of hypotheses. Major journals like Nature will often run articles which do nothing other than outline an hypothesis. In the case of Nature, such articles are clearly indicated as hypothesis-only features. Wells' paper isn't marked 'hypothesis', but at least as it appears in Rivista, it is not presented as anything more than the description of a new model for centriole function. There's nothing unscientific or inappropriate about such a scientific paper, and I see nothing inappropriate about its inclusion in Rivista. The issue, then, is whether the paper is any good. Are the ideas coherently based on what is already known? Is the hypothesis testable? Is it plausible? Does it have any explanatory value? Is the article a valid contribution to the scientific literature, based on the criteria just mentioned? How has the hypothesis fared in the two years since it was published? What does the article reveal about the utility of "intelligent design theory" with regard to the development of hypotheses in cell biology? In considering question 1, I have prepared a review, proceeding as though I am reviewing the manuscript for publication in a reputable journal. My review considers only what was known in 2005, and addresses some of the technical details of the paper. I've included my "summary & recommendation" section below. My thoughts on the other two questions are below, where I discuss why I think Wells' hypothesis should be rejected, and offer some comments on the relationship between the article and "intelligent design theory." 1. Review of manuscript #QOD-01, "Do Centrioles Generate a Polar Ejection Force?" by J. Wells. Summary & recommendation. In this manuscript, the author reviews current knowledge regarding the structure and function of centrioles in animal cells, then proposes a novel role for centrioles in the generation of the polar ejection force. The author's proposal is plausible and testable, but suffers from two main weaknesses: 1) the hypothesis is somewhat extravagant, while seeking to fill a knowledge gap that is not similarly dramatic; and 2) the hypothesis is highly speculative and poorly supported by current data. Moreover, the author misrepresents current uncertainty regarding the cause of the polar ejection force, and fails to convincingly establish a strong correlation between presence of polar ejection forces and presence of centrioles. Given the author's stated antipathy toward "neo-Darwinism" it is perhaps not surprising that he omitted the more detailed taxonomic survey that is needed to strengthen the claim of correlation. And the author glosses over the known roles of centrioles in the formation of cilia, structures known to be absent in land plants. Overall, the manuscript is generally clear and well-written, but is weakened by ad hoc swipes at evolutionary theory and some concluding speculation (on cancer biology) that is unacceptably vague and simplistic. Attention to these matters should improve the manuscript such that it will be suitable for publication in Rivista di Biologia, and I recommend that it be published after revision. 2. What is the status of Wells' hypothesis now? First here's an overview of the hypothesis and the phenomenon it seeks to explain. The picture above shows one centriole, but they always come in pairs, tethered together and oriented at right angles to one another, like a pair of numchuks spread out. Centrioles have always fascinated cell biologists, because they have some bizarre properties. First, their shape. 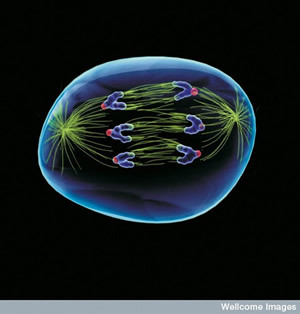 Second, their highly regular behavior: each cell has exactly two centrioles, which duplicate during cell division to form the odd L-shaped pairs. And during cell division, the centrioles sit inside a structure called the centrosome, which is centrally involved in the movement of genetic material during the all-important process of mitosis. In this picture, the chromosomes are those boomerang-shaped things, and they're being dragged to the right and left by the yellow threads, which represent microtubules. The chromosomes aren't usually shaped like boomerangs; they look like that here because they're being dragged by the red knobs, and the floppy arms are lagging behind. Why do the arms lag? It looks like there's a force pushing on them, driving them back from their destination -- it looks like there's a wind blowing. That's the polar ejection force. Cell biologists have long postulated that the polar ejection force is due to the influence of motors attached to the chromosomes themselves. These motors, called chromokinesins, are known to control various other aspects of chromosome movement, and even in 2005 when Wells published his paper, the polar ejection force was known to be at least partly due to chromokinesins. Wells noted correctly that the story was incomplete in 2005: candidate motors had been identified, but questions remained about their ability to provide the needed force. The gap in our knowledge, however, was unremarkable. Motors that were capable of moving chromosomes, and that were present in the right places at the right times, had been described. Wells' first big error, in my view, came when he looked at the gap and concluded that "something more must be involved." Whoa. Might something more be involved? Sure, but that's true of nearly every aspect of cell biology. Must something more be involved? Even in 2005, I would have said no, and if I had reviewed Wells' manuscript, I would have urged him to tone it down. His proposal was extravagant in any case, but pitched as a needed plug for a significant hole in biological understanding, it was flat goofy. What was Wells' idea? Well, he thinks that centrioles look like turbines. So he thinks maybe they are turbines. And so maybe they rotate around each other, just at the right moment during cell division, and create an oscillation in all those microtubules, thereby generating a vortex that drives the polar ejection force. And maybe that rotation is regulated by calcium. That's the Rivista paper in a nutshell. The ideas are testable, and plausible to the extent that they don't invoke functions or phenomena from way far out. But they aren't based on any data. There are no observations that even suggest that centrioles rotate (and Wells postulates rotation rates of up to 10,000/second), nor have microtubules been seen to exhibit the vortex-like oscillations that Wells' hypothesis predicts. And most importantly, the polar ejection force is not known to affect anything other than chromosomes. But Wells' hypothesis predicts a "wind" blowing into the center of the cell, a wind that would exert force on every particle between the two poles. In other words, even when the paper was published, its ideas came out of left field. I doubt that the paper has ever been cited by another cell biologist. No one has published any observations to suggest that centrioles rotate or that a vortex is induced in a dividing animal cell. A proof-of-principle experiment would have been technically challenging but perfectly feasible, if a little expensive. (Here's one idea: use video microscopy to look for movement of inert particles, perhaps fluorescent beads, inside the postulated vortex of the mitotic spindle.) Whether Wells ever tested his hypothesis (or whether he meant to), I don't know. But now, in 2007, there's no need. Two different lines of evidence make Wells' hypothesis unworthy of further consideration. Largely normal chromosome behavior, and the polar ejection force, can occur in animals that completely lack centrioles. The properties of a particular chromokinesin appear to completely account for the polar ejection force. Either one of those results would have killed the idea. 3. What does this episode tell us about "intelligent design theory?" Wells' paper described an unsupported hypothesis that was proposed to fill a minuscule gap in cell biological knowledge, and the hypothesis has since been shown to be completely without merit. For me, it's a struggle to find words that adequately communicate the failure of this article to achieve any scientific respect. The Discovery Institute calls it a "peer-reviewed scientific publication...supporting the theory of intelligent design." Maybe that says it all. But here are some comments on how Wells went about presenting his idea. First, to reiterate: he overstated the problem he was trying to solve. It seems to me that his enthusiasm for the centriole-as-turbine idea caused him to seek a place for the idea no matter what. 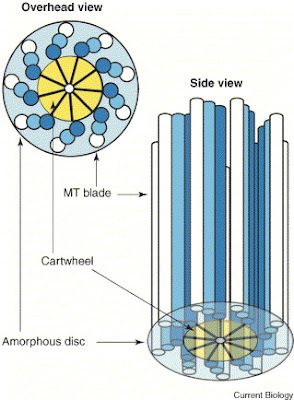 In other words, I surmise that he floated the centriole-as-turbine concept because he wanted centrioles to be turbines, and not because he sought an explanation for the polar ejection force. This is a dramatic failure for one of the leading (former) scientists of a movement that seeks to remake the very basis of scientific explanation. It seems to me that the last thing the ID people should seek is a wild-eyed, unsupported speculation, based on no observational evidence and shown to be completely mistaken within months of publication, as an exemplar of their approach to scientific explanation. Worse, this is Wells' area of expertise, and I suspect that this paper was his last and best contribution. Second, Wells takes some idiotic swipes at evolutionary science in his paper, and I see significant irony in some of them. In the abstract, he disclaims "molecular reductionism and neo-Darwinism." What is his paper about? A laughably incorrect speculation about tiny turbines, in which their properties are wholly accounted for by...molecular reductionism! Finally, what about this paper could possibly be distinctive as the work of an ID theorist? Only this: that he considered the possibility that tubular structures could be turbines. Now, is that really an ID distinctive? Has Wells noticed how cell biologists refer to motors, cargo, tracks, export, import, zip codes, sorting? Cell biologists regularly identify patterns in biology that make sense through reference to structure-function relationships, and cell biologists are happy to refer to those functions using the vocabulary of design, both literally and metaphorically. If that's all that ID thinkers have to offer, then maybe they should just get back in the lab with the rest of us and try to figure out how all this stuff works.